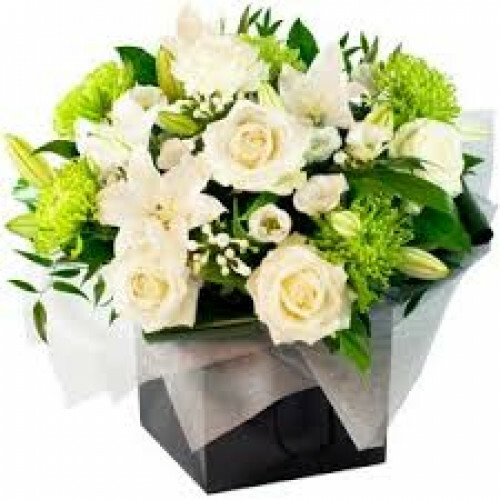 Crisp and fresh white and green Dutch Flowers including lilies, roses santinis and blooms. This a nice large gift bag of flowers delivered in Galway and also we deliver flowers direct in Ireland. Contact Irish phone number of person receiving the flowers? Chocolates perfect finishing touch to any order. Chocolates may vary from type shown. To order.. Cute soft quality cool dude teddy bear 8 inch approx, can only be purchased as an add on. Lovely plu..
A nice bottle of sparkling wine is the ideal add on to any order. To order simply add to any other p.. This is our number one seller This is a fabulous hand tied Dutch flower bouquet of gerbera, eus..
Rich vibrant seasonal bouquet of flowers, bright orange and vibrant burgundy blooms in a bed of rich..
Delivering flowers in Galway faster than our competitors. Try our delivery service and see the difference. Nationwide flower delivery also available. Knocknacarra Florists were part of an international design team for decorating the Vatican, we have also joined exhibitions in Thailand. Super fast flower delivery and great personal service. We are dedicated to making sure you get the flowers you need delivered when you need! Our floral team has been in the business for nearly three decades, its safe to say we know our stuff. call us on 091 586666, we're here to help. We are passionate about our work and always keen to please. We have built our business through hard work and dedication to our clients. We have a large base of repeat customers and we look forward to welcoming new customers both personal and corporate. Copyright © 2019, Knocknacarra Florists®, All Rights Reserved. Knocknacarra Florists® Registered Trademark.